Phyco-Biotech company is a supplier of natural fluorescent tags APC, APCXL, CPC, RPE and BPE, known as phycobiliproteins and extracted from microalgae. We control the whole process from biomass production, extraction and purification leading to state-of-the-art phycobiliproteins. We are supplier of LifeTech and CisBio Bioassays.. Application fields: medical diagnosis, flux cytometry, immunohistochemistry, DNA microarrays, FRET,..
We are also producer of trace element rich microalgae (selenium, iron, copper….) for food supplement market. We are currently working on R&D program to produce new natural fluorescent tag “colors” in order to extend the offer for simultaneous assays as well as modified phycobiliproteins structure to improve their spectral properties. We’re looking for new customers in San-Diego area and/or a partnership for the development of new assays with a supplier of high-quality biochemicals and reagents for molecular biology, life sciences, clinical, and histology areas of research. 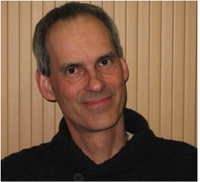 Nicolas Jouy graduated a PhD in Plant Physiology in 1990. He’s been working on plant and microalgae valorization ever since. Since 1995, he’s specialized in phycobiliproteins and high added value molecule purification as well as microalgae trace element enrichment. In 2011, with Gilbert Gay, he founded Phyco-Biotech company.